Mild to moderate emissions of ash and incandescent material (probably as strombolian explosions) continue at the summit vent(s). A small ash plume rises approx. 1 km and is currently drifting east. Alert level remains red. A new intensification of activity cannot be ruled out as it is not known how much of eruptible magma in the volcano's storage system has been evacuated during the strong eruptions on 22-23 April. Starting from 23:30 local time last night (23 April), activity at the volcano has again increased. The volcano started to produce more or less continuous small to moderate ash emissions, that have been reaching up to 2 km height and drifted mainly northeast. SERNAGEOMIN published images taken during yesterday's overflight, which show the effects of the large eruption on 22 and 23 April - burnt vegetation, fresh ash deposits, both from hot pyroclastic flows that reached up to 8 km distance and water-saturated mud flows (lahars) that traveled up to 14 km through ravines draining from the volcano, in particular the Rio Blanco river bed on the SW side. The volcano has so far stayed calm, but the alert level remains at red because another explosion could still occur. A major problem in this situation seems to be that eruptions such as the recent one are likely to remain something impossible to predict - at least in some cases. It seems that the eruption on Wednesday evening was only preceded by 15 minutes (!) of an intense intense earthquake swarm that could reasonably have been served as a clear warning sign. The 21 y-o mountaineer who was missing and feared victim of the eruption has survived and has been rescued, fortunately. Together with a small group of friends, he was on excursion on the mountain when the eruption occurred last night. During their escape, he decided to stay behind because of cramps and then lost his way, forced to spend the night in the forest, until he could make phone contact with his family this morning. The violent eruption of the volcano that had started at 01:00 local time this morning lasted about 6 hours and gradually waned. However, a third explosion in the near future remains a possibility. Strong seismic activity with a medium of 150 volcanic-tectonic earthquakes of magnitudes up to 3.6 were recorded during the paroxysmal phase of the eruption. Significant ash fall of up to 50-60 cm occurred in nearby downwind areas, while in the more distant areas of Los Ríos and Araucaní some millimeters of ash fell. More than 4100 people were evacuated after the first eruption yesterday evening. A curfew was in place in Puerto Montt, Puerto Varas and Puerto Octay from 23:45 to 05am to prevent looting in abandoned houses and shops. Although the eruption was extremely violent, produced abundant heavy ash fall and pyroclastic flows, it seems that it only claimed one victim. A young mountaineer who at the time of the eruption was at a mountain shelter was reported missing, presumably dead. Satellite images show interesting gravity waves (ripple-shaped ring waves) in the ash plume that developed when the initial plume rose into the stratosphere and spread laterally. A second explosion occurred at 01:00 local time (4am GMT), even stronger than the first one last evening. VAAC Buenos Aires reports ash to 40,000 ft (12 km) altitude while other sources speak of heights up to 15-20 km. Pyroclastic flows occurred during the second eruption on the southeast flank, caused by partial collapse of the eruption column. A large ash plume is moving northeast and has reached Villa Angostura and Bariloche in Argentinia where ash is now falling. In more nearby areas such as Ensenada (Región de Los Lagos), up to 40 cm of ash have been reported. Spectacular images of the subplinian eruption column and plume at day and night, including volcanic lightning, are emerging everywhere on the net. A few examples from embedded posts with links are found at the end of this post below. The first eruption that had started 18:08 local time last evening followed only 2 hours of strong seismic activity recorded by Sernageomin, but otherwise came as a complete surprise. Over 4000 people were evacuated or fled from an area within 20 km radius of the volcano during the first hours. 3 small towns are now deserted (Ensenada, Correntoso, Lago Chapo). Significant ash fall occurred in areas to the east and northeast of the volcano. The airport of Puerto Montt is closed and flights are diverted to Valdivia. In the city itself, people tried frantically to refuel cars and stock up supplies, leading to traffic jams, empty supermarkets and chaos. The first pulse only lasted about 2 hours and was followed by a lava flow that was active by around 19:30. This was initially suspected based on seismic signals from Sernageomin, but photographs appeared later that confirm this. The wide ash plume from Calbuco this morning has drifted northeast and reached Temuco in Chile and Bariloche in Argentinia. A major explosive eruption started at the volcano yesterday afternoon (20:45 GMT). 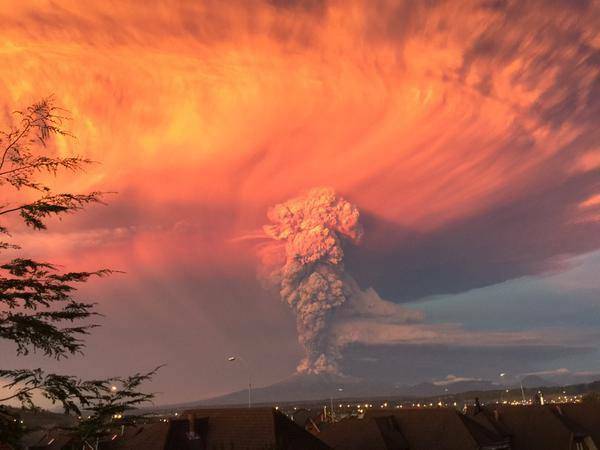 VAAC Buenos Aires reported an ash plume to 30,000 ft (10 km) altitude. According to Sernageomin, the eruption stopped already a few hours after. Aviation color code was raised to red as a warning to aircraft to avoid the area. Calbuco volcano southeast of Lake Llanquihue in southern Chile is a andesitic stratovolcano partially covered by glaciers. Its last eruption was in August 1972.